Kris Mukai’s latest sees the versatile cartoonist veer into yet another direction after the grimy humor of Commuter and foraging adventure of Bibi The Witch. As the title suggests, Weeping Flower, Grows In Darkness is decidedly more ominous in tone: Young friends Eleanor and Antony wander alone in the woods among a sea of dense, shadowy flora and discover a strange white flower. There’s an undercurrent that’s not immediately readable—they talk about the disappearance of Jeremy and Lawton, although it’s initially unclear who these people are and what’s happened to them. But the presence of them—or their absence—is very real, and integral to the kids’ reactions. As it emerges that Jeremy and Lawson are Eleanor and Antony’s respective older brothers, Mukai’s deft hint at the unsettled acrimony between the families helps illuminate unfolding events. Something has happened between the older boys that the younger children don’t seem privy to; it seems they’ve either run off together or are in trouble of some sort. The uncertainty, whispers, and lack of disclosure has seeped down to Eleanor in particular, and paired with the appearance of the strange flowers and the results of an internet search, she begins making her own connections. The manner in which little incidents or an object take on significant meaning through the eyes of specific person, reflecting the psychological state of the beholder—here, Eleanor’s growing fixation with the flowers—is strongly reminiscent of early garo (alternative manga). Mukai nails that irrational creeping tension perfectly. The projection of Eleanor’s preying thoughts and anxieties onto anything vaguely out of sync with things as they should be—even something insentient—bloats it into new and unnatural shape. The symbolism of the flowers is more overt, too. Eleanor and Antony’s apprehension over events runs together with the changes they see in people close to them. As siblings grow up and a little apart, a confusion can manifest over altered equations and relationships, over perhaps not understanding and knowing people as well as you thought. Strange things grow when secrets are left to ferment, so when things are inexplicable within the spectrum of knowledge you possess, you look beyond to other possible explanations. The apparent lack of communication here has impacted Eleanor and Antony individually, their friendship, and their family units, leading to a pocketed isolation. To that extent the growth of the flowers also signify a fear of discovery, or growing up—to grow up and become like Jeremy and Lawson, and acquire knowledge—and a loss of innocence, becoming different and strange. To Eleanor’s mind it’s simply a matter of time before the same fate befalls her: an image mirrored in her dreams in which pink, wormy tendrils rise from abscesses in her body—the same growths she saw protruding from her vision of Lawson’s corpse. There are a lot of stories out there that have been done to death, but there’s something particular about “competent and troubled woman with a mysterious past and male love interest fleeing terrifying corporation/government/mob/her dad” that keeps people coming back for more. From The Fifth Element to Firefly to Nikita to Dollhouse, you can find bits and pieces of the same basic plot all over the place, and RunLoveKill #1 (Image) looks like it’s going to settle comfortably into that pastiche. Don’t let that fool you, though; this book’s got a lot going for it. Even the cover, by artist and co-writer Eric Canete, looks more like a photograph of a white-washed maquette than traditional comic art, and it stands out among a sea of color. Inside, the first couple pages are dominated by a back and forth between sleek action sequences of a woman taking on what look like prison guards and quieter blue-toned panels of a woman playing cello. Canete does something neat with these in particular, showing the musical notes as she plays to convey a sense of progress and speed. The fights are immediately reminiscent of Æon Flux and similar animation, no huge shock there since Canete worked on the show, as well as Beware The Batman and a handful of comic titles. Leonardo Olea’s beautiful colors and his skill for lettering and design make sure it doesn’t feel too much like ground that’s already been tread visually, taking two-dimensional art and making it rich and textured. There are even lens flares, though they’re used judiciously and appropriately. A brief shot of the ocean from underwater is particularly well done. Romantic comedy is a genre that doesn’t get much attention in American comics, but books like Pénélope Bagieu’s Exquisite Corpse (First Second) show why that needs to change. Originally published in France in 2010, this graphic novel is a delightful, beautifully rendered story about a 22-year-old Parisian girl that escapes her depressing life by sparking a relationship with a reclusive author, and the growth of Zoe and Thomas’ affair over the first half of the book is so charming and rich that it makes up for the rushed, undercooked second half. Zoe lives with a deadbeat boyfriend in a shithole of an apartment, is ogled all day at her job as a product rep at trade shows, and can’t break out of her soul-crushing routine. But everything changes when she sees a man peeking at her from behind the curtains in his apartment and decides to ask him if she can use his bathroom. Bagieu does great work highlighting the humor of this initial sighting by contrasting Zoe’s friendliness with Thomas’ horror: When she realizes she’s being watched, Zoe throws Thomas a casual wave and a smile, which he responds to with a look of pure terror. So what’s all this talk about the Avengers, then? One would think they had a movie or something coming out. You know, Steed & Mrs. Peel. Anyone writing from a week in the past can only speculate as to whether or not Avengers: Age Of Ultron will succeed. Small independent films have such a hard time gaining traction in today’s crowded marketplace! Still, one must admire Marvel’s confidence in the film, rushing to put out a movie tie-in graphic novel. It’s easy to imagine Barnes & Noble stacking Rage of Ultron (Marvel) on its “in theaters” table alongside movie-cover copies of Far From The Madding Crowd and the official novelization of Paul Blart: Mall Cop 2 by Alan Dean Foster. Unfortunately, any fan of the movie picking up Rage Of Ultron looking for a companion to the film will walk away confused. With Jonathan Hickman’s Time Runs Out sucking the air out of the room for the past few months, Rick Remender’s relaunched Uncanny Avengers has flown under the radar. Part of this is due to the fact that Remender’s Axis event was a steaming hot mess. Remender’s momentum coming out of his memorable run on Uncanny X-Force dissipated as a result of months of PR missteps and an overlong time travel story that tested many readers’ patience. But Uncanny was still a readable book because—despite its bulky remit as the connective tissue between the Avengers and X-Men franchises—it was really just a refreshingly old-school Avengers book. 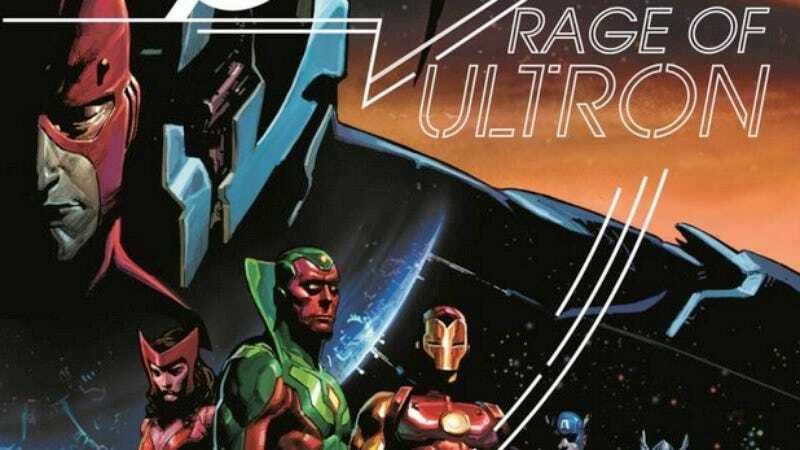 Rage Of Ultron picks up on threads from Remender’s Axis, Uncanny, and Secret Avengers runs, but mostly hews closely to what might be called the “Classic” Avengers mode: Captain America, Iron Man, Thor, the Vision, and the Scarlet Witch fighting the team’s greatest enemy, for all the marbles. The problem is that after a decade and a half of gradually escalating Ultron stories—beginning with Kurt Busiek and George Perez’s “Ultron Unlimited,” moving on to Annihilation: Conquest, and most recently Age Of Ultron (the terrible crossover, not the movie)—it’s hard to think of a feasible hook that hasn’t already been sharpened. This time, Ultron is back with a scheme to turn the Earth into a world of cyborgs. That itself isn’t particularly revolutionary, but Remender chooses to focus primarily on Ultron’s family ties. Here’s the problem: The movie has effaced those ties, such that instead of having been created by Hank Pym, Ultron is now Tony Stark’s invention. The deep family ties that form the basis of Remender’s story—Ultron is Pym and the Wasp’s “son,” the Vision is their “grandson,” the Scarlet Witch had Ultron for a father-in-law, even Magneto used to be involved before Remender’s Axis (don’t ask)—will be unfamiliar and baffling to movie fans.